This week, in my ongoing effort to complete my spring cleaning, organize my office, and prepare for the coaching class I will teach in August, I have also read two new books by one of my most favorite authors- Ralph Fletcher. 1) THE SANDMAN- Ralph's newest picture book. "Tor is a tiny man, no more than five inches high, but he has a big problem. Tor can't fall asleep at night." One day, while he is walking in the woods, Tor finds a dragon's scale. He takes it home, and soon discovers the dust from the scale is the answer to his sleeping problems. A great take on the legend of the Sandman. Fletcher's poetic command of language is always reflected in his picture books, and this one is no different. A perfect aloud for a unit on folklore or an author study; also a GOODNIGHT MOON kind of bedtime read aloud. This story is enhanced by Richard Cowdry's illustrations. I especially loved the first page. Tor is riding through the woods in his cart with wheels made of buttons, while a raccoon, rabbit, and three different birds, probably ten times his size, watch over him. I also loved the pictures of dragons, with their very realistic scales! • Great characters- I especially liked Dan, the Vietnam vet who owns the clam boat. I also loved Jazzy- Yeah, she's cute, but also smart, and musical, and athletic. What a great role model for our middle school girls! I love that Fletcher has such a wide range of writing- I can definitely imagine handing this book to a middle schooler who knows Ralph's other novels- FIG PUDDING, SPIDER BOY, FLYING SOLO, UNCLE DADDY or MARSHFIELD DREAMS- from his younger years. We are reaching the time in summer when I'm realizing that all of the projects, all of the cleaning and organizational stuff that I intended to do is probably not going to happen. Some people might approach this realization with renewed effort, and actually accomplish a few more things. When this book opens, Addie, a twelve-year-old girl, and her mother, Mommers, are moving into a trailer located under an overpass in Schenectady, New York. Addie's mother and stepfather have recently split, and her stepdad, Dwight, has been awarded custody of two younger sisters. Addie, however, must live with her mother, who is more than a little unbalanced, and probably even bipolar. Addie is an amazing kid. Despite the struggles with her mom, who is regularly away from the trailer, and then a learning disability, she somehow manages to craft a pretty workable life for herself. She plays the flute, cares for her pet hamster, and becomes friends with the people who manage the mini-mart next door. Throughout the book, Addie's relationship with her stepfather, Dwight, is a stabilizing force in her life. Every year, I meet one or two Addie's-- kids who are basically having to raise themselves, with the support of a few caring adults. I'm glad to add WAITING FOR NORMAL to my list of books to give to those kids. Somehow, knowing that they are not alone, and that other people, even fictional characters in books, make it through rough situations, seems to help. Anna Quindlen has an interesting article in this week's Newsweek. A high school teacher attended the Freedom Writers' conference in California last summer. She was excited about how Erin Gruwell had used reading and writing to open up the world for her students, and wondered if it might do the same for her own students, who came from similar backgrounds. She purchased copies of the book, but then was told that she had to wait for district approval to use the book. Approval was slow in coming, so she forged ahead, and was fired. I haven't quite worked up to links yet (soon!) but you can cut and paste this to read the article yourself. Earlier this spring, I came across HOW TO STEAL A DOG, by Barbara O'Connor. I loved, loved, loved this book, and have decided that it will be my first read aloud of the year, when I begin teaching struggling fourth and fifth graders at Stedman. This morning I finished GREETINGS FROM NOWHERE, another new favorite by Barb O'Connor. Another book I love, love, loved! Willow- a ten-year-old girl who has an "almost perfect life" except that her parents don't love each other. Dorothy, Willow's mother, leaves the family, and Clyde, her dad, decides to start over by buying the Sleepy Time Motel. These four characters, along with their families, connect at the Sleepy Time Motel. I loved this book. It's a story of loss- of people who have to let go of people, places, and objects that they love. I know so, so, so many kids who face that every day. Their grief is so big and books like this make the hurt a little easier. GREETINGS FROM NOWHERE is also a story of hope and redemption- of people who need and find and care for each other. I know so, so, so many kids who need books like that too. They need to know that even when life is really, really hard, there are people, adults and kids, who will be there to care for them. I loved the relationships in this book- Aggie's relationship with the kids, especially Kirby and Willow, who seem to so hungry for love. I loved Loretta's relationship with her adoptive mom and dad. I'm an adoptive mom, but I don't think I'm nearly as good at it as she is. I loved Kirby's relationship with Burla, a woman who evidently took him under her wing in his past life. I loved watching Willow, Kirby, and Loretta develop a friendship with each other. I loved the fact that no one in this book had much, at least not in terms of material things, but at the same time, everyone was so willing to share the little that they did have. Most of the kids I know are a lot like these kids- they don't have much. And yet again and again, I'm overwhelmed by their willingness to share- a half bottle of perfume on my desk at Christmas, a well-loved stuffed animal for our reading corner, the dessert from a Lunchable on a field trip. That message is so, so contrary to the "have lots, get more" message that kids see again and again and again in today's media. On a wanna be writerly note- Barb O'Connor does an amazing job "constructing" this book. Each chapter focuses on one of these four characters. Barb O'Connor is so great at keeping the story moving, and at using actions and dialogue to develop characters. A definite five-star winner!!!!!!!!!!!!! I can't wait to share this book with kids!!!!!! And I want to get the rest of her books and put together an author box for the classroom! (The Colonel) loved the starch and stiff uniforms and boots polished to a high shine. He was crazy about military parades, and had dragged me and TJ to parade grounds from Fort Benning to Fort Ord. I'd even seen him get teary-eyed when the troops passing in front of the inspection stand turned right-face to salute whatever bigwig officer was sitting in the catbird seat. It got to him every time. Having grown up in this culture, Jamie and her older brother TJ, also love all things military. They answer the phone, "Colonel Dexter's quarters." They spend after school hours enacting fierce battles with their green plastic army men. Once, after a particularly fierce battle, TJ makes Jamie a medal of honor out of a silver gum wrapper. When TJ enlists in the Army and is sent to Vietnam, Jamie is absolutely thrilled. She is confused by the Colonel's less than enthusiastic response to the fact that his only son has enlisted. Jamie can't wait to start getting letters about her brother's experiences. She is surprised, then, when he sends he canisters of film, which she learns to develop in the dark room at the rec center on base. I loved this book. I'd love to use it in a middle grade study of the Vietnam War or war in general. I'd love to use it to show kids how a writer embeds history into a work of fiction. I grew up in the sixties, during the height of the Vietnam War, and this book helped me understand this conflict in ways I never had before. I'm always on the lookout for authors, artists, and poets that look and sound like the children I teach. I have struggled, a little, (and would love some suggestions!) to find Hispanic poets that are accessible to elementary kids. On that note, Francisco X. Alarcón is a poet I absolutely love. His seasonal collections are ones that I return to again and again. Each poem appears in English and Spanish. He has lots of strong images, deals with issues kids face (e.g. grandparents, first day of school), and also does lots of great stuff with sensory details and looking at things in new and surprising ways. He has a new book of poems about animals that is being released the last week in July. I can't wait to read it! I have to confess. I'm not much of a television watcher, and I'm sure not a Sunday morning television watcher. When my mom told me that Tim Russert had passed away, I had to think for a minute to remember who Tim Russert was. Nevertheless, I'm fascinated by the stories of people's lives- who they are, what experiences shaped them, who they love, etc. Last weekend, then, I picked up BIG RUSS AND ME, the story of Tim Russert's relationship with his father. Russert grew up in a working class neighborhood in South Buffalo. His father, Big Russ, always held two jobs. First, he was a garbage collector and later a supervisor in the Sanitation Department. Then he drove a truck that delivered the newspaper in Buffalo. Tim grew up attending parochial schools. He talks again and again about the teachers, the nuns and priests that mentored and shaped him into the scholar, the thinker, and the man he became. In some ways, Russert's upbringing reminds me of my own. Big Russ believed in hard work, and discipline. Tim knew that the teachers/coaches/bosses were always right, and if he got in trouble at school, he would be in twice as much trouble at home. Big Russ, however, was also man who loved his wife and his kids, and who laughed often. Hearing people talk about Tim Russert in the past few weeks, it would appear that he inherited all of these qualities from his dad. Most of all, Big Russ was a man of huge integrity. When I talk about integrity with my boys (and we talk about this subject on an almost daily basis) , I always tell them that everyone in your life- your family, your coaches, your teachers, your friends, the salesclerk at the grocery store- would describe you in the same way, and that you make the right choices and do the right thing whether or not anyone is watching you. My dad, as imperfect and human as he was, was a man of huge integrity. I hope I inherited this quality, and I hope I pass it to my guys. 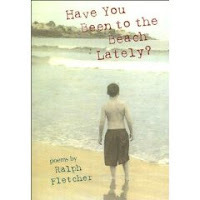 My poem is from Ralph Fletcher's waterific book, HAVE YOU BEEN TO THE BEACH LATELY? Ralph beautifully captures experiences of a day at the beach- getting buried in the sand, finding a hermit crab, playing in the waves, a summer storm, a beach barbecue. Perfect for reading at the beach, or for those of us land-locked beach wannabes in hot, dry Colorado! the sea refused to cooperate. whenever a wave drew back. long enough to shake hands. Several years ago, my book club read SNOW IN AUGUST by Pete Hamill. The book, a fable, is set in Brooklyn in the mid-1940's. The main character, Michael Devlin, is a twelve-year-old Irish Catholic immigrant, whose father died in World War II. Michael becomes friends with a Jewish rabbi, also an immigrant, from Prague. The antagonist in the book is Frankie, a twenty-ish punk who terrorizes the neighborhood, beating up Jews and destroying their property, with seemingly no ramifications. Good and evil come face to face again and again. I love historical fiction, and thoroughly enjoyed this book. At the same time, I found it a very difficult read. I had to draw on my background knowledge, and kind of fill in a lot that I didn't know. Most of the people in my book club felt similarly. In August, my fourteen-year-old son will start high school. Last spring, the school issued a summer reading list. Ninth graders have one book, SNOW IN AUGUST. I'm bound and determined that Isaiah will start high school on a good note. To that end, we started reading SNOW IN AUGUST about ten days ago. I'm reading a chapter a day aloud. Afterwards, we give the chapter a title, and note important events. We are on chapter ten, and should be done in plenty of time. At the same time, I am feeling more than a little frustrated. I know some people would say that high school should be rigorous, but I wonder why the school would choose such a difficult book as a welcome. Zay doesn't have the background knowledge to read and understand the book himself, so I'm reading it to him, and scaffolding, and helping him make connections. I'm hoping our notes will help him to carry on coherent conversations when he gets to high school this fall. I think about Zay's friend, Eddie, whose mom speaks mostly Spanish, and wonder how he will ever get through the book. Another friend, Justin, probably won't read the book at all, or will start the night before school begins. What will happen to kids who don't read the book? The book is chock full of beautiful writing and description. It moves way too slow for my son's tastes. At one point he said, "We've read three whole chapters and nothing has happened." Today, we read a fourteen page chapter, most of which described Prague in the late nineteenth and early twentieth century. With so much good YA literature, couldn't they have chosen something a little more interesting and engaging, a little quicker paced, for summer reading? I also wonder what they are going to do with the book. Is it the basis for a study of WW2 or immigration, or good vs. evil, or heroes? A genre study of fables? Are the kids going to take tests, and need to remember lots of details, or will they write essays about the book? A statement of purpose would have been really nice. Sometimes it's hard to be a parent and a teacher. 1) Mid-May: Hard drive on my six month old Apple computer crashed. No computer for two weeks. 2) End of May- End of school year. No reading, no blogging, no nothing. I think I'm struggling a little, too, with the whole idea of blogging. Do I just write about books, or do I share a little of me, too? People who know me would want to know, for instance, that about two weeks ago my sweet, laughing, yellow lab, Maggie, was diagnosed with cancer of the spleen, and had to be put to sleep. And they would probably want to know that 12 hours after returning from Memphis, I was at the Dumb Friends League looking for a new friend. Jack Black, an eight-week-old black Lab/Rottweiler, mix will join our family this afternoon. Anyway, I said this blog was going to be about reading, and I have been doing a little of that too. In June, I read almost exclusively adult stuff. 2) QUIET STRENGTH by Tony Dungy- I'm always looking for books that will help me understand my guys better and provide positive role models for my boys. I've been looking at this book since it came out in hardback a year ago, and finally purchased it two weeks ago, in paperback, I definitely was not disappointed. Tony Dungy, head coach of the NFL Indianapolis Colts, was a former high school and college football standout, who played in the NFL for about three years before becoming a coach. He is also a committed Christian and a father of six. One son, Jamie, tragically took his own life, about two years ago. Dungy impressed me with his commitment to Christ and his family. He continually stressed that football is just a game, and he talked again and again about people he knew, e.g. his sister, who is a pediatrician, who do more "important work." I loved his perspective and his sense of priorities. This is one I will definitely read again, and one I would like my guys to hear. I've also read Jodi Piccoult's CHANGE OF HEART and THE BREAKDOWN LANE by Jacquelyn Mitchard. Both were ok reads. Piccoult amazed me, as she always does, by her ability to put a totally new twist on an event, or a character's motivation. As she often does, Piccoult addresses the subject of Christianity and why people believe what they believe. She isn't afraid to ask hard questions. I know this makes some evangelical Christians uncomfortable, I appreciate her perspective. Jacquelyn Mitchard is one of my favorite authors, but THE BREAKDOWN LANE didn't do that much for me. I read it in Memphis, and it was an ok read, but definitely not great. Finally, I read PLAYING FOR PIZZA by John Grisham. I've enjoyed many of Grisham's books over the years, this one, not so much. All the way through, I kept wondering why he wrote the book, what message he hoped to deliver, what he wanted readers to think about when they were done reading.